Whether you earn your living working up a sweat, or squeeze in workouts when you can, it’s easy to fall prey to eating errors that unintentionally hold you back from getting the most out of your workouts. Here are five common missteps I see, and how to correct them to reap the rewards of your hard work. Eating Too Little Fat Despite my recommendations to include good fats at every meal, like avocado, nuts, seeds and coconut oil, some of my clients remain fat phobic, and will scale back, fearing that fat is “fattening.” But the truth is, getting enough fat is a smart strategy for both sports nutrition and weight control, because fat: delays stomach emptying, so you feel fuller longer; increases satiety, to shut off hunger hormones; boosts antioxidant absorption, which in emerging research is related to leanness; and ups metabolic rate, to help you burn more calories. In fact, fat is one of the most vital nutrients in your diet, because it’s a structural part of your cells, which means you can’t heal a cell or construct a new one without enough fat to perform these important jobs. Cutting back too much can result in fatigue, chronic hunger, or a lack of satiety, irritability, depression, a weaker immune system and an increased injury risk. So even if you’re trying to reduce your body fat percentage, don’t be afraid to add almond butter to a smoothie, top your salad with avocado, and sauté your veggies in extra virgin olive oil. Filling the fat gap can be the key to finally seeing results. Using A Sports Drink When You Really Don’t Need One If you sweat heavily, work out for more than 90 minutes, or exercise in hot, humid conditions, reaching for a sports drink rather than plain water is a smart way to keep hydrated, stay fueled and replace the electrolytes lost in sweat. 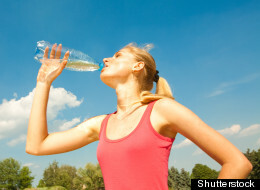 But if you’re exercising for less than an hour and a half, in a climate-controlled gym, plain water should be fine. The carbs in sports drinks are designed to keep you going when you can’t stop to eat, but if your muscles don’t need the fuel, just one 20 ounce bottle means consuming a surplus 35 grams of sugar, the amount in about 20 gummy bears. And while unsweetened coconut water is a little lower, an 11-ounce jug still contains 15 grams of potentially unneeded carbs. Not Eating After A Workout Because You’re Afraid To “Eat Back” What You’ve Burned While it’s true that overcompensating for a workout by eating too much can prevent you from shrinking your fat cells, striking the right balance is key. Working out takes a toll on your body, and having the right raw materials to heal and repair the wear and tear is important for seeing results. In other words, it’s not just the training itself, but the healing from the training, that mends muscles, boosts metabolism and makes you more toned and fit. So while a good hard workout isn’t a license to sit down to a big plate of pasta, or eat dessert every night, you should be eating something afterwards, with a goal of delivering the nutrients your body needs to properly recover. Only Eating Protein Post Workout While protein is a key recovery nutrient, it’s only one piece of the puzzle. In addition to a lean protein source, like a smart phone-sized portion of fish or chicken or a scoop of lentils, you should aim for plenty of produce (to replenish nutrients and supply antioxidants), a healthy fat source (which also helps muscles heal and optimizes circulation), a small serving of a whole grain, like wild rice or quinoa (to replete glycogen, the carbohydrate stored in muscle tissue, which serves as a primary fuel source during exercise) and of course fluid, preferably good old H2O (to rehydrate). If you exercise after work, a great post-workout recovery dinner would be a stir-fry made with chicken, shrimp or organic tofu, along with a variety of colorful veggies, over a small portion of whole grain rice, topped with sliced almonds or black sesame seeds. For a simple aromatic stir-fry sauce, that’s not loaded with sugar, whisk together a few tablespoons of brown rice vinegar, with a splash of fresh squeezed citrus juice (like tangerine or blood orange), and a dash each of fresh grated ginger, minced garlic and crushed red pepper. Doubling Up On Recovery Meals For my pro athlete clients, I highly recommend eating something like an all natural bar or shake within 30 minutes of the end of a game or a tough training session whenever possible, because starting the recovery process within a half hour has been shown to help maximize healing. But employing this strategy if you’re not a pro can wind up working against you. For example, if you munch on a bar or grab a smoothie on the way out of the gym, then go home and eat dinner, you may be in recovery overkill. While it might not register as a meal, a bar with 30 grams of carbohydrate, 5 grams of fat, and 10 grams of protein is like eating a small turkey sandwich with mayo. 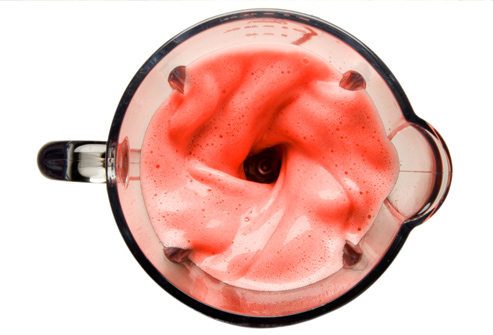 And a smoothie can be the equivalent of three to four handfuls of fruit, plus a container of yogurt. Downing these “snacks” just an hour or so before eating a regular dinner, can mean giving your body far more than it needs for recovery, which results in feeding your fat cells, rather than shrinking them. If you’re going to be eating a meal with an hour of leaving the gym, skip the bar and shake. And if it’s going to be a little longer, munch on something like almonds, which supply some protein, good fat and nutrients, to tie you over. I found this article and recipe by Marni Sumbal and I thought I would share it on my site. As an endurance athlete I find it very hard to keep from eating everything in site after long workouts. 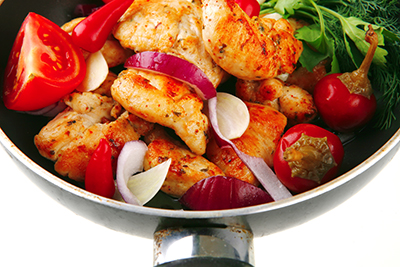 These habits and this recipe will help not over indulge from the post workout cravings. Like any recipe you can make modifications to better suit your taste or for what is in your cabinet. I replaced the tofu with grilled chicken, the wild rice with plain brown rice, and I left out the nutty dip. Other than that I kept everything the same. I hope you guys enjoy the tips and feel free to add a comment on how you modified the recipe or if you liked it. For the first point — you will see my recipe below which could be titled either “rice bowl with veggies” or, for more nutritional value and nutrient density, “veggie bowl with rice.” I find this very effective for individuals who struggle with portions, have trouble making healthy changes in the diet (to be long-lasting) or struggle with giving up (or eliminating) favorite foods. This makes it much easier to make slow, gradual changes by introducing more healthful items (like veggies) but not completely give-up some of your favorites. As we all know, habits can be changed. Learning new behaviors doesn’t happen quickly so by making a few swaps you may find yourself gravitating to a new style of eating. I also find this a fantastic tip for all those who have considered an off-limit food list to change body composition. When working with athletes I coach, we say no food is off-limits but we always address how that food makes us feel and how it helps us reach our goals, which leads me to my second point. Like I said it sounds very simple but this can make the difference of eating 1/2 cookie and feeling very satisfied with your small portion of a treat after dinner versus having 2 cups of ice cream with chocolate syrup, granola and a few berries on top. I hope you enjoy my latest creation. It is inspired by the rice bowl at Moe’s Southwest Grill. If these vegetables are not your favorite, feel free to swap in veggies that you enjoy most. In large skillet on low-medium heat, cover bottom of pan with 1-2 Tbsp olive oil. Add veggies (recommend to steam corn, peas and broccoli for 1:30 in microwave) and tofu and stir occasionally. When tofu begins to turn golden brown, add sliced leeks (you can use chives or onion) and basil (chopped). Turn off heat when mixture is soft (around 12-18 minutes depending on heat) and add 1-2 Tbsp nutty dip and stir gently. Cover and let sit for 1-2 minutes. 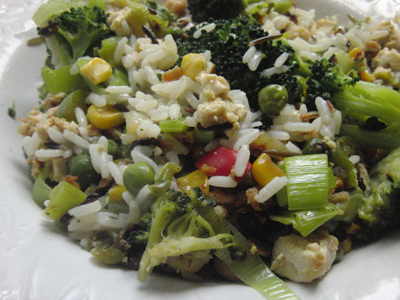 In large bowl, add 1 serving of rice (recommend 1/3 – 1/2 cup wild rice to start) to your veggie mixture. Mix and enjoy!